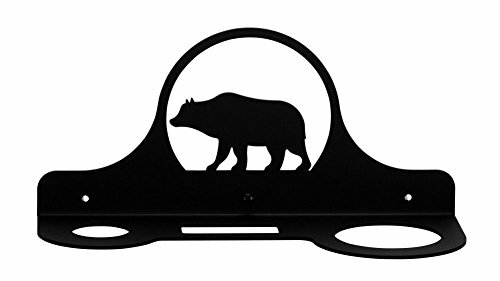 Wrought Iron Bear Hair Dryer Rack :: 11 In. W x 5 In. H x 4 In. D. Openings are 1 1/2 In Round 2 1/2 In. x 1 In. Rectangle 2 3/4 In. Round This product is completely USA made! Hand crafted with an iron finish in powder black. Mounting screws included. A Bear never has a bad hair day. Oh to be a bear with beautiful no nonsense hair. The bear is both a symbol of power and of confidence. Nobody hurries a bear; he takes his time and does things on his own terms. Now you can be inspired by the confidence of the bear to get through any day, even a bad hair day with the Wrought Iron Bear Hair Dryer Rack. The wrought iron hair dryer rack features the silhouette of a peaceful bear in a circle. The bear bathroom décor holds a standard blow dryer and includes mounting screws so it's easy to install. The handcrafted bathroom fixture has a flat powder black finish and is made in the USA. This blow dryer holder blends with contemporary and rustic styles and works in homes, cabins and lodges. Look for other bear and woodland themed items throughout the site. Make things snug and neat by making places for everything. The bear owns the ground she walks on, and now you can control your space with the Wrought Iron Bear Hair Dryer Rack. View More In Hair Dryer Stands. If you have any questions about this product by IronWorks, contact us by completing and submitting the form below. If you are looking for a specif part number, please include it with your message.